Hepatology 2014 59(4), 1262-72. LY294002 purchased from Selleck. different signal-inhibitory profile by applying 120 nmol/L BGT226, 20 μmol/L LY294002, or 100 nmol/L rapamycin in FaDu cells. Clin Cancer Res 2011 17, 7116-7126. LY294002 purchased from Selleck. Stimulation response of p37d-expressing cells. (c) Western blot of 5 min serum stimulated HEK-293 cells stably expressing p37d, p110d or control, with the presence of inhibitors as indicated at the top. Oncogene 2012 31, 3277–3286. LY294002 purchased from Selleck. Immunofluorescence and flow cytometric analyses of the translocation of ABCG2 in MCF-7 FLV1000 cells before and after treatment with the PI3K inhibitor LY294002. Confocal microscopy of MCF-7 FLV1000 cells after a 16-h treatment with 2 uM or 4 uM of LY294002 was performed as described in Figure. Br J Pharmacol 2013 70(5), 1137-51. LY294002 purchased from Selleck. Mol Oncol 2013 7, 359-68. LY294002 purchased from Selleck. Inhibition of EGFR and PI3K/AKT pathway has additive effects in SCCHN cell lines with constitutively active PIK3CA mutations, while removing negative regulation of PI3K/AKT pathway increases resistance in sensitive SCCHN cell line. A, results from MTT assays on cells treated with PI3K inhibitor, LY294002, and gefitinib. Lyn-PI3K-BTK signaling is required for the inhibitory effect of anti-CD180 on the activation of IFN-α signaling. (a and b) Isolated murine splenic B220+ B cells were pretreated with dasatinib (5 μM), a Lyn inhibitor; LY294002 (5 μM), a PI3K inhibitor; ibturinib (1 μM), a BTK inhibitor; enzastaurin (1 μM), a PKC β inhibitor; U0126 (3 μM), an ERK inhibitor; SP600126 (2 μM), a JNK inhibitor or SB20358 (1 μM), a p38 inhibitor for 1 h, followed by stimulation with anti-CD180 antibody (0.2 μg/mL) or mouse IFN-α (1000 U/mL) for 4 h. qPCR analysis of the expression of IFIT1 (a) and MX1 (b). (c) Isolated murine splenic B220+ B cells were pretreated with dasatinib (5 μM), LY294002 (5 μM), and ibturinib (1 μM) for 1 h, followed by stimulation with anti-CD180 antibody (0.2 μg mL−1) or mouse IFN-α (1000 U mL−1) for 40 min. Western blot analysis of the phosphorylation level of STAT-2. The data shown represent the mean values of three independent experiments, and the error bars represent the SEM. *p < 0.05, **p < 0.01, ***p < 0.001, as determined by ANOVA; ns denotes p > 0.05. Cell Mol Immunol, 2017, 14(2):192-202. LY294002 purchased from Selleck. The effects of GLP-1R siRNA and LY294002 on neurological score at 24 hours after subarachnoid hemorrhage (SAH) in Ex-4 treated rats. Neuropharmacology, 2018, 128:142-151. LY294002 purchased from Selleck. Biochim Biophys Acta 2012 1823(5), 987-96. LY294002 purchased from Selleck. Comparative effects of wortmannin and LY294002 on ADRP and β -casein synthesis. Con fluent HC11 cells were treated according to the standard procedure in the absence or presence of 4 ng/ml EGF either with or without 100 nM wortmannin or 50μM LY294002. Cellular proteins were analyzed by SDS-PAGE and immunoblot successively probed with anti-ADRP, anti-β-casein, anti-β -actin antibodies and their respective HRP-conjugated secondary antibodies. ECL signals were quantified by densitometry and normalized to β-actin. Each experimental condition was performed in triplicate. Percentages of inhibition for both inhibitor and hormonal treatments are indicated in the text. 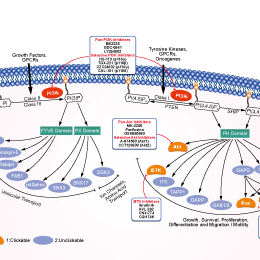 Inhibition of PI3K, ERK and mTOR prevents the activation of S6K1 and S6 induced by suppression of PKD1 activity. A549 cells were incubated in the absence (-) or presence of either 5 uM Kb or 5 uM Kb and 20 uM LY294002 or 5 uM Kb and 10 uM BKM120 (as indicated) for 1 h prior to stimulation of cells with 50 nM PMA for 30 min and 1 h.
Int J Biochem Cell Biol 2015 60, 34-42. LY294002 purchased from Selleck. IGF1 increases apical fibronectin in late stage blastocysts. Representative confocal images of blastocysts stained for fibronectin (Green) and DAPI (Blue). Day 5 blastocysts were cultured in SS medium for 24 (A and B), 48 (C and D) or 72 h (E-H) in the absence (A, C and E) or presence (B, D and F) of 10 ng/ml IGF1 or in the presence of a PI3 Kinase inhibitor (5 uM LY294002 + 10 ng/ml IGF1) (G) or in the presence of 10 ng/ml IGF1, attached to a coverslip (H). Scale bars represent 20 mm. Red line indicates location of coverslip. Arrow indicates location of the inner cell mass (ICM). The following total number of blastocysts were analysed, from at least 3 experimental repeats in each treatment; 24 in the SS group (24 h), 21 in SS plus IGF1 (24 h), 26 in SS (48 h), 30 in SS plus IGF1 (48 h), 40 in SS (72 h), 59 in SS plus IGF1 (72 h), 13 in SS plus IGF1 + LY294002 (48 h) and 15 blastocysts were analysed that were attached to a coverslip (72 h). Hum Reprod 2015 30(2), 284-98. LY294002 purchased from Selleck. PTEN transfection or inhibition of the PI3K-AKT and IGF-1R signaling pathways increases the trastuzumab sensitivity of NCI-N87/TR cells. After treating the cells with a PI3K inhibitor (LY294002), the expression of AKT and P-AKT proteins was assessed by Western blotting. Tubulin expression indicated equal loading. All gels run under the same experimental conditions and the experiments were repeated 3 times. The representative images were cropped and shown. Control: cells without any treatment. Sci Rep 2015 5, 11634. LY294002 purchased from Selleck. 2010 Saraswati Sukumar of Johns Hopkins University School of Medicine. LY294002 purchased from Selleck. T47Dcells were pretreated with 100 ng/ml EGF for 20 min and then treated with the indicated concentrations of LY294002 for 24 hours. 2010 Dr. Zhang of Tianjin Medical University. LY294002 purchased from Selleck. Chaussade C, et al. Biochem J, 2007, 404(3), 449-58. Semba S, et al. Clin Cancer Res, 2002, 8(6), 1957-63. Hu L, et al. Clin Cancer Res, 2000, 6(3), 880-6. Gharbi SI, et al. Biochem J, 2007, 404(1), 15-21. Severine I. Gharbi, et al. Biochem J. 2007, 404(3):449-58. David Davidson, et al. Front Pharmacol. 2013, 4: 5. 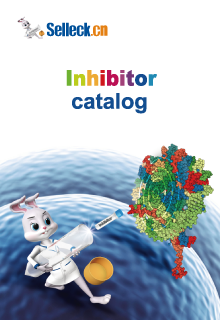 I want to buy a inhibitor that can inactivates Akt/PI3K. I notice the protocol of LY294002 (catalog no. s1105) says it will inactivates Akt/PKB. Is LY294002 available for Akt/PI3K inhibition? LY294002 is the first synthetic molecule known to inhibit PI3Kα/δ/β with IC50 of 0.5 μM/0.57 μM/0.97 μM, respectively. It can inhibit PI3K/AKT. PKB is the alternative name of AKT. It can be dissolved in 4% DMSO/30% PEG 300/5% Tween 80/ddH2O at 5 mg/ml clearly, and the concentration of DMSO is safe for in vivo experiments.